A stylised vintage forties telephone which has become an iconic collectors item has been reconstructed using layers and layers of horizontal recycled plastic sheeting. Looking closer it may be possible to see the brilliant colours in the sheets are actually compressed mobile phones … The batteries sim cards and electronics have been removed and the cases are converted into 6 or 8 mm sheets. 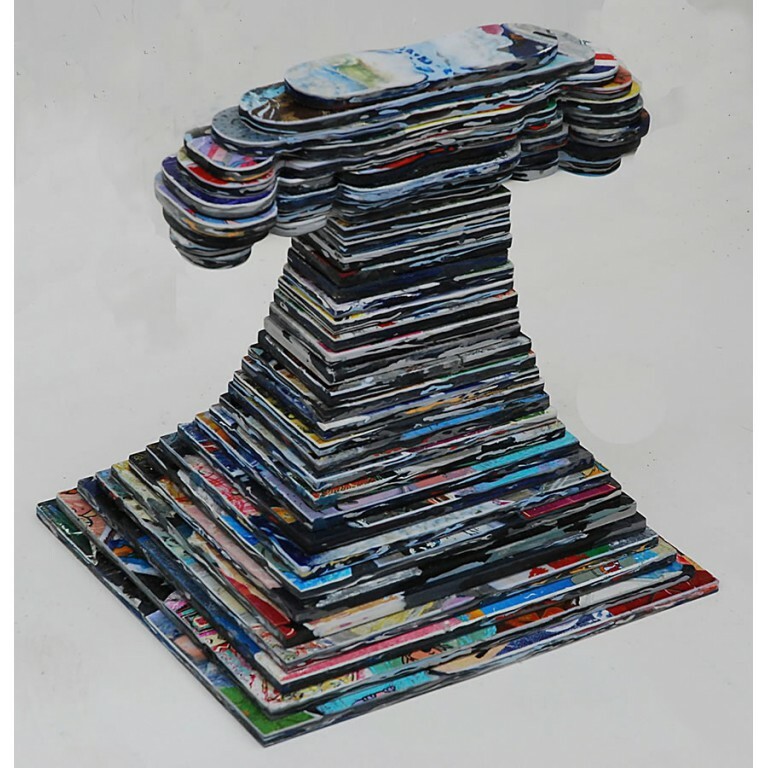 Each phone can be seen in tortuous detail compressed into two dimensions but still clearly identifiable as someones personalised mobile saved from the landfill and preserved as a recycled artwork or carved sculpture for ever. In the UK customers replace mobiles every 18 months on average and 15 million are discarded per annum. If thrown away this would generate 7,500 tonnes of potentially harmful landfill. When they degrade they can cause damage to the environment. In China which is the worlds largest consumer of mobiles people change fones every 3 – 4 months. According to a recent article in the Observer, we discard 1700 mobiles an hour and each is packed with toxins – mercury nickel tin lead lithium chromium pvc and liquid crystals. Here in the UK 600 charities collect used fones but more and more ewaste is exported to countries where due to a lack of environmental regulations and infrastructure recovery workers and neighbouring residents are exposed to health risks and the environment to pollution hazards especially Africa and the Asia-Pacific region.